Art lovers...music lovers...food lovers resulted in a classy detailed design to suit this professional couple's lifestyle. 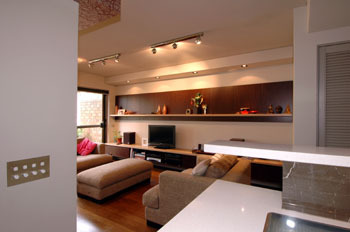 These apartments were designed for a couple in Ultimo with no kids wanting uncompromising quality. Both work in the nearby CBD and this was to be their long term residence. At the end of construction, the owners happily announced they were pregnant and now have a beautiful baby girl. A great project for all. 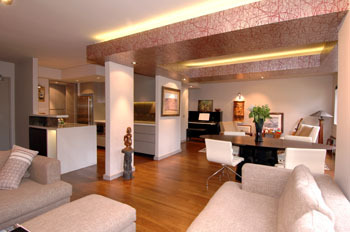 Our specialty is designing open plan areas but with each "room" possessing distinctive qualities that define them. In this instance, the dining room is open to the living room beyond but the design quality reinforces where the room ends. This is just one method to make areas seem larger than they are. 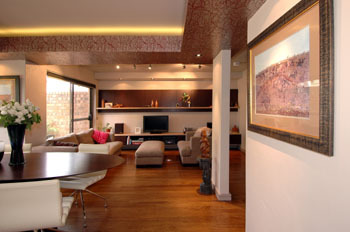 The living room joinery conceal electronic equipment and is a unifying element throughout the apartment. 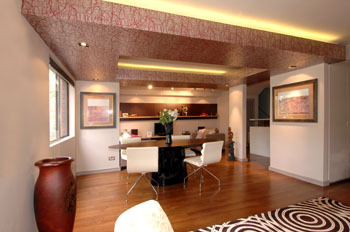 The concealed lighting in the wallpapered bulkhead above creates an atmospheric space for dining and enjoyment. The bulkhead similarly defines extents of each area, looking through to the lounge area beyond. 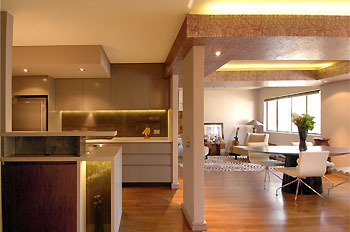 The dining room is connected to the kitchen but separated by the structural blade wall and the extent of the wallpapered bulkhead. Another view of the wallpapered bulkhead. The concealed lighting above the bulkhead is from LED strings and provides a soft humanising effect. Another view of the wallpapered bulkhead this time from the lounge room. 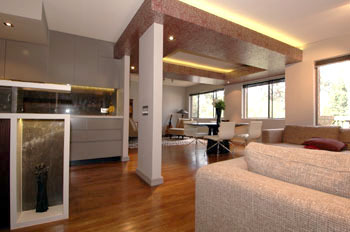 The lounge room also contains an inset carpet specially designed and set into the timber flooring. 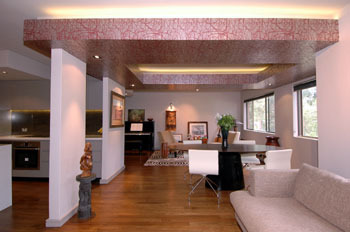 The dining room is connected to the kitchen but separated by the structural blade wall and the extent of the wallpapered bulkhead. Concealed lighting is consistent in both areas. 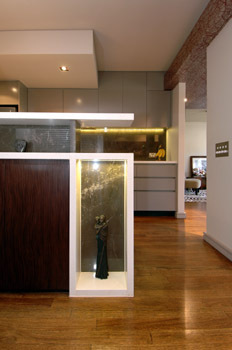 Areas are set aside for sculpture collected by the owners and allows them to highlight special pieces, similarly lit with LED's. 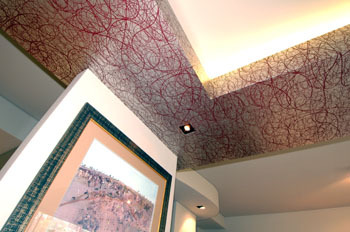 The wallpaper detail with the concealed lighting provides a magical effect. Architecture highlights: open plan areas, piano room, separate lounge-living-study-dining areas in one large open plan area. Acoustic works completed resulting in very quiet apartment.